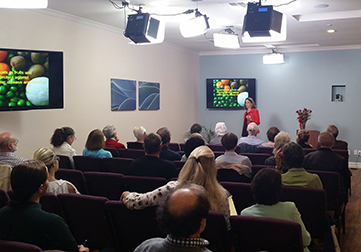 The educational studio at Pacific Pearl La Jolla was created through the financial support of Miraglo Foundation and the Taylor Advised Endowment Fund for Integrative and Holistic Medicine Education and Research. We offer a library of information in our Video Gallery from Dr. Mimi Guarneri and other notable leaders in integrative healthcare. The gallery is updated regularly with new videos. See the headings when you pull down the Innovative Education Menu from the top bar. Our Wellness Resources page there has extensive educational offerings and resources. Review the Events Calendar for The Studio at Pacific Pearl La Jolla. Check out our News page – Articles are cataloged by general topic and by the month posted. We continually add new ones. Link to the Academy of Integrative Health & Medicine, below. See Holistic and Integrative Medicine Resources for professional training options including rotation at Guarneri Integrative Health, Inc. and programs for transforming your practice into an integrative model: Link here. Here are some of Dr. Guarneri’s blogs. To read her articles, go to MimiGuarneriMD.com for her wellness blog and much more! TOP 5: ARE YOU INFLAMED? CREATE A TRIBE – YOUR LIFE DEPENDS UPON IT! The Academy of Integrative Health & Medicine (AIHM) unites the many voices in integrative health — from family doctors to psychologists, acupuncturists to nurses and every practitioner in between — to build bridges between professions and offer credible educational and certification programs for licensed healthcare providers. There’s a place for you, no matter what your profession in healthcare. Dr. Mimi Guarneri is President of the AIHM. The AIHM is an interprofessional association of integrative clinicians who embrace a person-centered, team-based approach to health care. It provides transformational educational programs, connections to a global network of providers, and valuable resources and toolkits for our members. The AIHM advocates for affordability and accessibility on behalf of patients and practitioners and builds leadership capacity in the next generation of caregivers. By combining science and compassion, they are transforming health and medical care. See their website for Conferences, Online Learning and the AIHM Fellowship. Sign up for their free newsletter.